In response to everyone, no problem guys! Deving is one of the most fun things I can ever think of doing. There's a huge satisfying feeling whenever new content is added into the game! So we will always keep this ball rolling. Also, this wasn't originally mentioned in the update post, but the middle mouse button can now be pressed down to rotate the game camera around and you can press the 'enter' key to login faster! This should make all content even more enjoyable! It finally happened! Thank you RR STAFF!!! the middle mouse button can now be pressed down to rotate the game camera around and you can press the 'enter' key to login faster! This should make all content even more enjoyable! I was wondering if this little but very useful option will be added and here it is! Absolutely beautiful. It was well worth the wait. Thank you, guys. 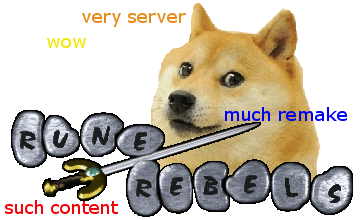 Long live RuneRebels. Absolutely biblical. Saw this post on Reddit! We have no idea how that happened lol. I remember testing this out and it worked. It will definitely be fixed for the next update. Thank you man! Welcome back! That's awesome! I'm glad it's getting some attention. And it's always nice seeing old players return!